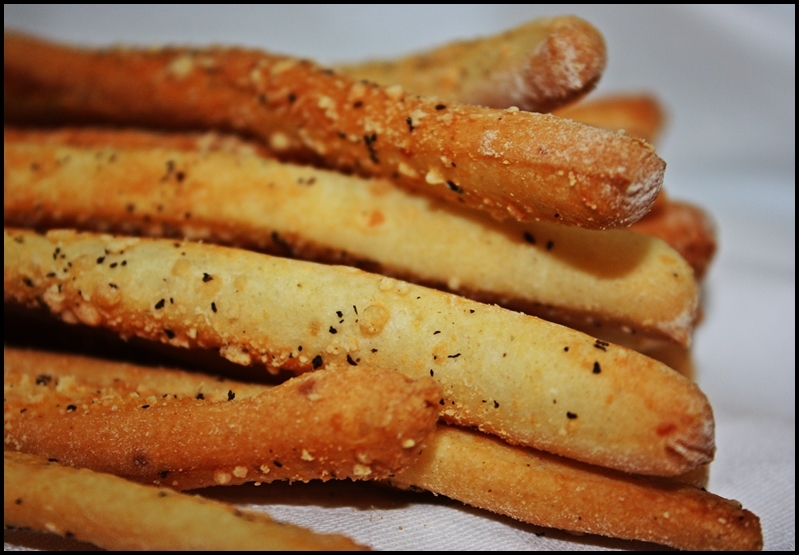 Pencil-thin breadsticks...grissini. Beautiful, aren't they? Easy to make, too. 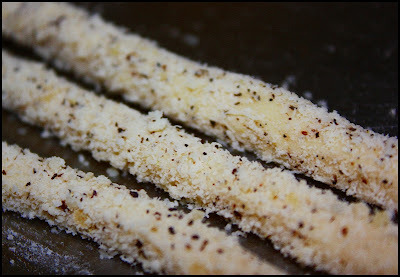 These are coated with Parmesan and black pepper making them even more tasty. But you may be wondering why I am making bread with refined flour (opposed to whole wheat). Well, I do now and again. But the real reason is that I just received this book to review for ChefTalk and this is the first recipe I've tried. It is a really good book; I recommend it at this point...I'll post a link to the review when finished. Anyhow, this recipe is about as easy as they come. Simply place most of the ingredients together in a bowl, knead it, allow it to ferment, cut it into strips, roll it in cheese, and bake them. Now all the recipes in the book are not this easy (in fact most are not), but this is an adaptation of the one in the book (of course I'll eventually make these with 100% whole wheat). I do hope you try these; they are simple to make and additively delicious. Combine the flour, water, olive oil, butter, salt, yeast, and 1/3 cup of Parmesan in the bowl of an upright mixer fitted with a dough hook. Knead the dough on medium for about 8 minutes, then cover it with plastic wrap and allow it to rise for about an hour. Preheat an oven to 375F. 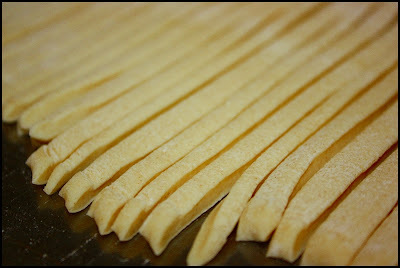 Roll the dough into a thin oblong shape and cut it into thin strips. Dust the work surface with a small amount of Parmesan and black pepper; roll the strips of raw dough the cheese and pepper. Transfer the dough to a lightly oiled baking sheet; place them close but not touching. Bake the grissini for about 10-15 minutes, or until golden brown.